The usual backstage women getting dressed sort of shots. Thelma Todd takes off her clothes to win a part in a Broadway play, and she does so with relish. The sheer relish with which Todd strips is hilarious. I didn’t screencap it, but there’s a fairly suggestive drawing of Jimmy Durante’s nose in here. Lots of drinking. And it looks like a blast! One clown wanders around, looking for his ‘thing’. He propositions Eleanor, “Perhaps you could tell me where is my thing?” Slap. I’m of two minds about Speak Easily. First, you have to be able to stand a lot of Jimmy Durante to get to its nuggets of goodness. 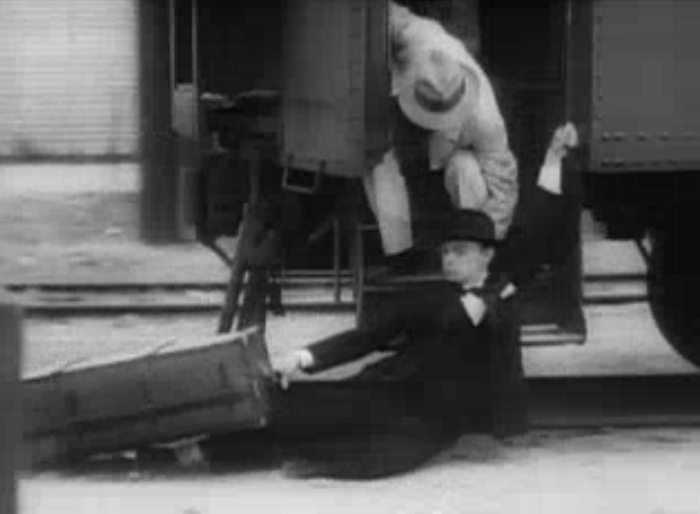 And second, those nuggets may be some of Buster Keaton’s best talkie work. Rather than being a moron as he’s been in a few of his less enjoyable pre-Code entries, Keaton’s character here is actually quite smart– a college professor with a flair for the Greek classics and long words. The problem is that he, Professor Post, has become a detached intellectual, so obsessed with learning that it finally takes a jolt– a $750,000 inheritance– to get him to reevaluate his life’s objectives. With the money, he’s going to do something crazy: go outside and live a little. We later catch a glimpse of his butler as he admits a fib: there is no inheritance, he was just trying to get Post to live a little. The butler assumes the conservative professor could surely never spend that much money, but, unfortunately, the American predilection to spend as much as you believe you have kicks in. Before long, Post has sponsored a local traveling theater group in their attempt to take Broadway by storm. To make things worse for him, his generosity isn’t because of their great talent (god no), but because the show stars the beautiful Pansy (Ruth Selwyn). He’s goaded on by the show’s buffoon ringleader, James (Durante), who shares Post’s inability to differentiate quality from sincerity. Looks like the professor has baggage. After The Passionate Plumber, the decision was to ramp up the Durante levels. If you are of the rare affliction of enjoying his schtick, this may be considered a good thing. I think Durante’s sincerity here is a boon, but, for the love of god, making bad jokes and pointing out that they’re bad jokes don’t make them funny. Another qualm I’ve got is that Durante’s exuberance sees him as loud and crass, and since the writing for Speak Easily showcases this, it consequentially reduces Keaton into becoming the straight man of the outfit. This is not an ideal situation. The real shame of that comes from how funny the film is whenever Durante isn’t around. 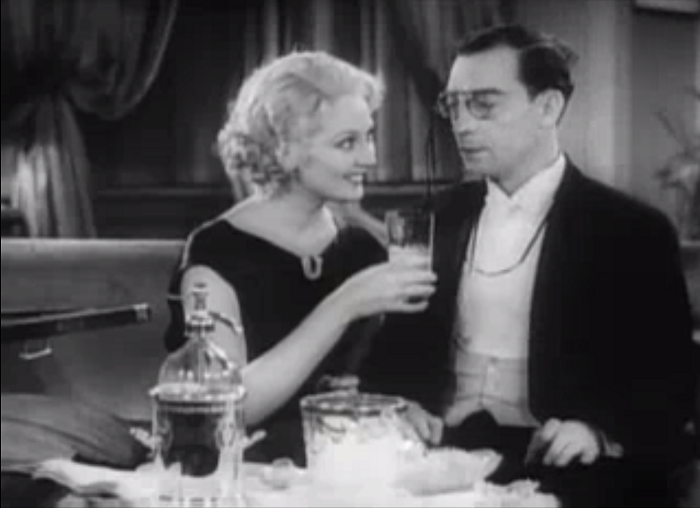 Take the best scene in the picture– and one of Keaton’s funniest, bar none– where he and Thelma Todd get drunk in her apartment. His rather quick shedding of the teetotaler status is matched by her desperate seduction attempts. Todd plays the wisecracking shyster three decibels below Durante and with enough selfish hedonism that her character never has to be liked, even if we understand where she’s coming from. If the rest of the movie were out and out wretched, this scene is almost to good enough to recommend on its own. As it is, the movie is only mostly wretched, so definitely get through it for this moment. The film’s ending, which involves the play’s debut and a breakdown on stage akin to The Producers, is at least a good display of Keaton’s abilities, or at least those mimicked by his mandatory MGM stunt double. His Professor constantly comes on stage to apologize for the havoc he accidentally reeks, only to be beset by another tragedy: knocking over chorus girls, swinging from the rafters, or even getting taken around the loop by a massive carousel. The guy swinging in from the right ain’t supposed to be. And while it looks well and good, its comedic trajectory is still a little off. The film’s climax is purely convenient, the bad guys thwarted by wackiness and the good guys triumphing against all logic. Like a lot of the film, it should be funnier. 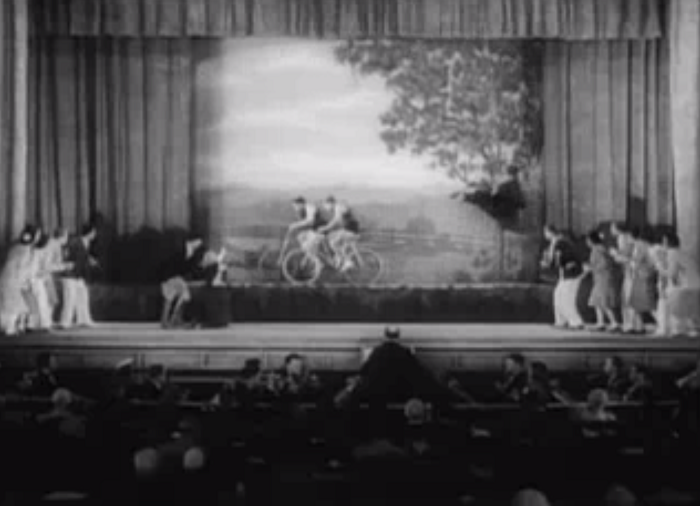 As a proto-Night at the Opera, though, it has the screwball logic but lacks in the anarchy. We never escape the feeling that the last act happens because a screenwriter dictated it rather than from any natural progression. I have found it interesting that many times in Keaton’s MGM films his clumsiness is equated with genius; Elmer becomes a film star for it in Free and Easy, and his accidents win him a reprieve and the girl in Speak Easily among others. The reason is to give Keaton an excuse for the many pratfalls, though it also creates an underlying feeling that something about these characters is innately flawed. Coupled with the dimwitted moniker that followed his characters for most of these films, it’s no wonder Keaton rebelled– he was the comedic version of the hunchback of Notre Dame. And MGM, being, MGM, never would let him escape that. There’s probably an subtext to Speak Easily, about finding yourself or letting love guide the way, or something else that nowadays you see mostly expressed on postage stamps or in Dreamworks movies. It’s also probably the least episodic of Keaton’s talkies, as the film’s plot proves to be an ample clothesline for moments of madness. It’s got some charms, and a really great scene to boot. Too bad it lacks the at least two other good ones to push it out of the mostly mediocre slump it’s stuck in. Dr. Macro has got a prescription for our need of Keaton stills! (hahahaha.) In particular, check out that poster. The women are wearing considerably more clothing in the actual film– as in, any clothing at all. Flapper Flickers and Silent Stanzas are one of the many reviews I’ve seen that consider this far and away the best Keaton film. I’m still favorable to The Passionate Plumber, but I think both films have their strengths. This is not a photo of train station, but rather moment of much training. Er, straining. The big question that raises its head whilst sitting through Speak Easily is ‘why Keaton?’ – in other words, exactly what does this film offer the great comedian? 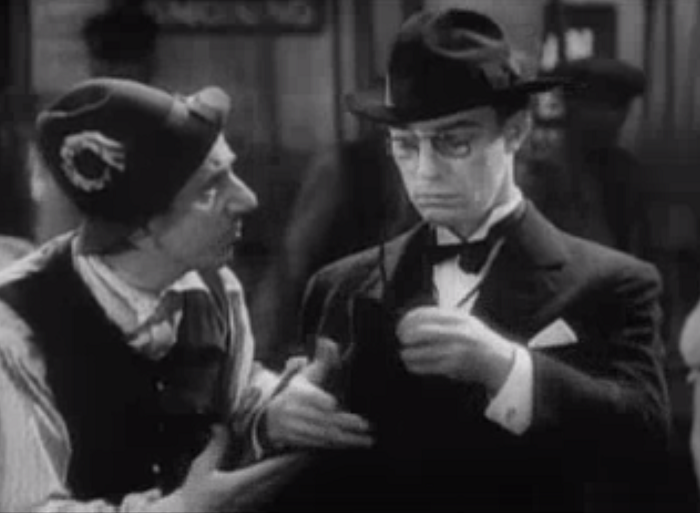 Too old to play the innocent romantic of his earlier and without an instantly recognisable personality as per Harold Lloyd or Chaplin, Keaton is effectively asked to play the straight man. You never get the impression that we’re trading on past roles here (rather you sense MGM is merely playing on Keaton’s name) and so it’s hard not to imagine that any actor could have occupied the role. TCMDB reveals that this is the only Keaton/Durante collaboration that Keaton had anything nice to say about. Keaton felt that James was the most like the real Durante. Durante is also heralded here, as he stood up for Keaton when MGM tried to fire him after this picture for his drunken conduct; both wouldn’t fare much better after their next picture, What – No Beer? I think editing all of the Durante solo bits from this movie may make it a lot better, but he and Keaton aren’t awful together. He’s just no Thelma Todd (if you hadn’t noticed). If you’re looking for something to watch for three hours that isn’t this movie three times, as of this posting YouTube has up Buster Keaton: A Hard Act to Follow, a documentary on his life from 1987. It’s pretty comprehensive and has a lot of good clips… though it really glides through his MGM talkies for some reason. THIS DOCUMENTARY IS GREAT, CHECK IT OUT. This film is available on Amazon and Warner Archive, and can be rented from Classicflix. It should be noted that all of the screencaps here come from the Archive.org copy of the movie and not the Warner DVD, which I’m sure looks remarkably better; unfortunately the disc was checked out when it was time to do screencaps. It’s also in the public domain if watching movies for free is ‘your thing’. The trouble with Durante, much like Bobby Clark, is that he didn’t translate to film. I’m sure he was great on stage, and there’s plenty of evidence that he was a wonderful performer on radio and television, so I’m very fond of him myself, but movies were just not his medium. I’m surprised you didn’t mention for the readers who haven’t seen it that not only do Buster and Thelma get drunk, but the next morning she explicitly states that she thinks he knocked her up. Now THAT’S Pre-Code!! Ha! Well, if memory serves while watching it, I think she’s faking that to entice him into marriage (or a nominal monetary settlement). I suppose I should have mentioned it, especially since Durante emerging from the bathroom agreeing to the wedding is his funniest bit in the film. Whatever the context, a line like “Do you remember saying that if a gentleman compromised a lady that he had ought to marry her?” would have sent Breen into apoplexy for sure. Nice review here, I always enjoy this blog. Just wanted to note regarding the comments on Hard Act to Follow, that Kevin Brownlow did a second, short documentary that focused on Keaton at MGM and the talkies, called “So Funny it Hurt, which is included in the TCM DVD set with the silent films. Definitely worth watching. Ah, okay. I did watch “So Funny It Hurt” (I think I mentioned it in the Passionate Plumber review, but I may have forgotten to), and it is a pretty good rundown on his time at MGM. I didn’t know they were by the same person, which explains a lot. Thanks for the info! Very entertaining and informative post – thanks! Good review. BTW, in almost every movie I’ve seen that Thelma Todd made for Hal Roach, the moviemakers always manage to get her stripped down to her undies in record time.